On one of my recent trips up north, I decided to spend an evening in Rishikesh specially to attend the Ganga Aarti (a ritual of worship by the river Ganga) at Parmarth Niketan. I had heard a lot about it and the last time we were there, we had missed it due to an extended session of river rafting. This time I made sure I was there well before it started. The sun was yet to set and the sky was still lit with orange hues. The priests had just finished arranging the aartis. The crowd was gradually stepping in and finding their place on the steps by the river bank. And then it began. The air was soon filled with the soothing sounds of live chanting and soulful music. The vibration of the mantras was pulsating. The focus had subconsciously shifted towards positivity. I was amazed to see a group of young boys with special places facing the river to perform the aarti. The atmosphere was pious and pristine. With more people joining in the aarti, the divine energy of the group kept rising. Age, country and language had no barriers as there were Indians and foreigners together enjoying the rhythmic reverberations. I could feel the goosebumps of this positive spiritual energy that surrounded us by the river Ganga. ‘Maa Ganga.. Ganga Maa…’. ‘Maha Mrityunjaya mantra..’ and other resonating mantras seemed to raise the aura of all present. So profound was the awareness of the moment. Yet so intense was the consciousness to be easily lost in a trance! This whole experience got me thinking of how mantras and prayers have always been an integral part of our tradition. We were introduced to mantras in our childhood when it was so easy to rote learn without questioning what they meant. Chanting of mantras is an ancient practise of Vedic origin but transcends all languages and religions. Be it in Jainism, Buddhism, Islamic or Hebrew, prayers and mantras are used to invoke the Divine entities. Long before science could support it, mantras were instrumental in healing practices. So also mantras were used to initiate a relaxed state of mind before going into meditation. They have a frequency that helps us align with our higher consciousness. Mantras act as a vehicle for our awareness to move inward. A means to the path of enlightenment. There are groups of ladies I’m aware of that use mantra chanting for eradicating troubles in other lives. Of helping people they don’t even know of by the sheer power of group chanting and praying. ‘Om’ chanting is a regular feature in yoga and meditation practices. There are many chanting classes burgeoning world- wide. And it doesn’t matter if they do not get the pronunciation right of the Sanskrit mantras. The benefits of meeting together and chanting, feeling the group energy rise and connecting with our inner self far outweigh the challenges of language or diction. That memorable evening by the Ganges will be etched in my memory for a really long time. It has reinforced my belief and faith in chanting mantras. It is a practice I want to consistently reiterate with my children. I hope more and more people embrace this powerful practice in their daily lives. It is that time of the year in India when the Hindu festival of Navratri is being celebrated with great pomp and fanfare. Navratri, which means nine nights, is considered to be the sacred period during which nine different forms of the Goddess are worshipped. From a spiritual perspective, it is also considered to be the time for introspection and taking the inward journey with your source. So during this sacrosanct time, when I heard about a workshop that helps you connect with the Goddess within, I was curious to know more. And when I learnt that different meditations related to the Goddesses were a part of this workshop, I simply had to do it. The timing couldn’t have been more perfect. ‘Living the Goddess Principle’ was a one-day workshop facilitated by ‘Joy for Life’, an energy space created through the empowered deLIGHT of two beautiful souls – Ellaeenah and Jogita. ‘Joy For Life’ is based on the cosmic premise that joy and abundance is the divine right for all. Bach Flower Remedies, Ho’oponopono, Crystals, Meditation, Angels, Sacred Geometry, Chakric energisation and more find their happy place here. The workshop began with a wonderful explanation on the duality in the forces of the universe and the significance of maintaining the balance between them. For every masculine there is a feminine energy, each of us having masculine and feminine energies within us in different proportions. These divine energies are not independent of each other but are essentially the twin faces of the Divine Consciousness. Even though they appear to be opposite, in reality they complement each other. The divine feminine principle is the creative force that sets the direction of evolution, whereas the divine masculine principle is the executive force that follows through on that direction. However over the years, with the advent of science and technology, the intuitive divine feminine energy has been suppressed by the egoistic divine masculine energy. In order to reclaim the balance in our universe, it is essential for both these energies to perfectly blend within us, so that a shift in consciousness takes place in the outer world as well. After a blissful meditation to bring to life the inner Shakti Goddess energy, we moved on to understanding and living the Goddess Principle. The Goddess Principle is the Cosmic Force of Universal Consciousness. It is by our own embodying through thoughts, words and actions that we bring alive this dormant energy. When we begin to express the qualities of different Goddesses is when we align with their frequencies and consequentially, their gifts naturally come to us. This was reiterated during the day with the help of beautiful meditations on the different Goddesses. The underlying thought was to help us realise that they reside in each of us. Lakshmi is the goddess of prosperity and the universal symbol of abundance in all areas of life – wealth, relationships, knowledge, health, beauty, etc. She represents attainment of goals through knowledge and discernment. Sitting on a lotus symbolizes that even with dirt around us, we can retain our purity. Being Lakshmi means living the qualities this divine energy represents. Imbalance in any area of life is Lakshmi imbalance. To attract Lakshmi, we must be Lakshmi. Saraswati is the goddess associated with education, music and language. She is a symbol of creative expression imparting us with the gifts of wisdom. The chanting of ‘Om’ and the cosmic sounds are associated with this goddess. To connect with her energies is to unite with our deeper spiritual truths. Durga in Sanskrit means the ‘fortress’, the unassailable and the invincible. She is the symbol of our inner strength and conviction. She serves as a reminder that within each of us lie an unbeatable goddess force that helps us defeat our inner demons. To connect with her energies is to connect with the power of the divine Shakti and become self-reliant. An interesting component of this workshop was an introduction to the Bach flower remedies. To explain this wonderful holistic science of healing would surely require another blog post. The most important essence of the workshop for me to go home with was to celebrate who I am. My strengths, weaknesses, my fears, anxieties, aspirations, all that makes me the way I am. To be myself and to live my truth – that’s above everything else. It is vital for me to take responsibility for my reality so that I can muster the courage to bring about the changes I desire. I want to give myself the gift of self-assertion over self-denial. For only then will I acknowledge the Goddess within me, and only then will I rise with her power! Ellaeenah Niloufer Jadefire is an Energy Intuit, Spiritual Counsellor & Mentor, and Life Coach for Personal Empowerment who focuses on Inner Child Work with body-mind-spirit synthesis. As a health facilitator, she practises and teaches many healing techniques like Crystals, Bach Flower Therapy, Sacred Geometry, Angel Cards, Energy Rebalancing to name a few. Read all about her work and services on www.jadefirelight.com. Jogita Jagwani has been on a journey of wellness for many years and she believes that wellness is not just an absence of illness, it is everything that makes the person happy, healthy and whole. As a health facilitator, Jogita practices various techniques like Bach Flower Therapy, Reiki, Nutrition Guidance, Energy Healing, Ho’oponopono, Chanting and Tarot Card Readings. She is a skilled social worker, having dedicated 20 years of work to V Care Foundation, a cancer care organisation in Mumbai. Indian mythology for me is reminiscent of all that I have read in the Amar Chitra Katha comics. The two Indian epics I know well are due to the good old television serials – Ramanand Sagar’s ‘Ramayana’ and B.R.Chopra’s magnum opus ‘Mahabharata’. Then after decades came Indian author Amish Tripathi and his Shiva trilogy – ‘The immortals of Meluha’, ‘The secret of the Nagas’ and ‘The oath of the Vayuputras’. This series had me engrossed and catapulted me into a similar world of fantasy. The history and geography of my country never seemed so appealing as a student back in school days. So when he was out with his first book of the Ram Chandra series, I wanted to relive the magic of mythology that he had wonderfully introduced. The ‘Scion of Ikshvaku’ had a few surprise elements in store for me. I wasn’t prepared to read a slightly different version from my (limited) knowledge of the epic. Hence, some bits of the storyline was a revelation – the long held resentment of the King against his son, Manthara being a rich, shrewd businesswoman, ‘Nirbhaya’ like twist in the plot and Sita meeting Rama before her ‘Swayamvar’. What stood out for me was the way in which the author reveals the emotions that make his characters come alive. Ram’s subdued pain that he has learnt to internalize is well written. So also the essence of his character comes out strongly in his adherence to his ‘dharma’ and law. The seething undercurrents between the queens in winning their husband’s attention were easily overlooked behind their costumes and jewellery on TV. The love and loyalty between the brothers evokes a sense of pride. The highlight for me was the introduction of Sita – a strong, feisty woman in all righteousness of an honoured princess. So much tougher from the timid, docile wife image that was showcased earlier. Even the Vishnu incarnate finds instant respect for her. Her beautiful and resilient form which is illustrated in book 2 ‘Sita –Warrior of Mithila’, makes you want to pick the book for the cover! What I thought didn’t work in book 1 was the modern day slang-like language at some places, which just didn’t fit into the times this story is set. The pace and storyline does slack in patches. It doesn’t leave you in as much wonder as the Shiva trilogy did. Yet the author succeeds in weaving the different threads of the script together, well enough to set the stage for the upcoming sequels. I am taking my Alexa Rank to the next level with #MyFriendAlexa and Blogchatter this September. 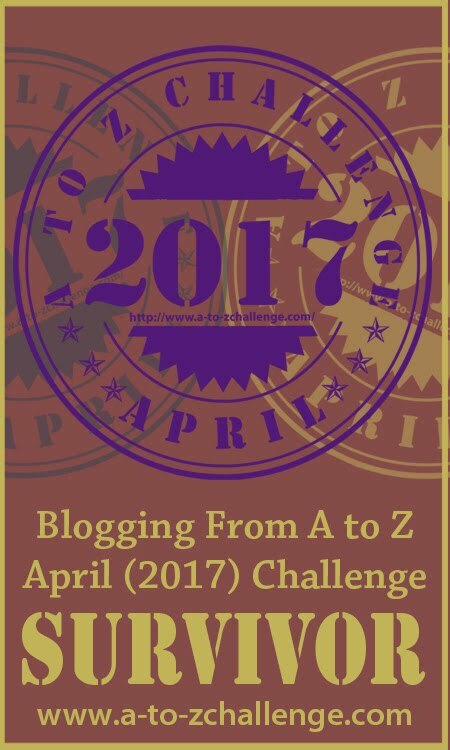 In April 2017, I took part in my first #AtoZChallenge of blogging. A blogathon of sorts with 26 posts a month going up on the blog in an alphabetical order, one every day barring the weekends. It turned out to be a terrific experience for me. It was the first time I could see an increase in the number of visitors on my blog. I realized the value of regular blogging and the significance of numbers in the blogging world. Number of posts, number of visitors, number of likes, number of comments, number of followers… and then one number that I discovered to be of paramount importance: the Alexa rank of my blog! Now, I had heard of Alexa before when my siblings spoke of how it was an integral part of their homes with the Amazon Echo. “Alexa, play this song of Ed Sheeran”, “Alexa, what’s the weather like today?”, “Alexa, what’s the time in Washington D.C. right now?” seemed to be an ongoing din in their homes. That’s when it struck me that there was indeed an Alexa that was ruling over the visibility and popularity of my blog in the big wide web world. As soon as I heard of it, I quickly looked up this all-important number of my website. To tell you the truth, I was aghast. Ouch! Never in my life have I ranked so low in any of my endeavours (ironically, higher the number, lower the ranking in this case). How painful to know that all my writing is not reaching out to enough readers online. It’s time to make a conscious effort and take the initiative to pump up the numbers in all my blogging efforts. And there comes Blogchatter, the savior for us newbie bloggers, with it’s #MyFriendAlexa campaign. So here I have jumped on to this bandwagon right away – the season Two of My Friend Alexa this September. An interesting period for bloggers to write, read, share, comment and interact. Post September, I am anticipating seeing a better number in all numbers for this blog. And more importantly, I am eager to connect with a lot many who would value what I have to offer here. I truly hope you are one of them and will stay connected. Our eight-day annual Jain festival ‘Paryushan Parva’ just concluded. The essence of this holy period is to emphasise on our spiritual growth by means of fasting, prayers, soul-searching, self-study or svadhyaya and meditation. We abstain from eating all roots and green vegetables during this time in order to increase our spiritual vibrations. On the last day after our main prayers called ‘Samvatsari Pratikraman’, we seek each other’s forgiveness by saying ‘Micchami Dukadam’. It means that ‘If I have caused you offence in any way, knowingly or unknowingly, in thought, word or deed, then I seek your forgiveness.’ We say this to everyone we know, irrespective of age or class or religion. As children and later as teenagers, this practice has been maintained as a family and religious ritual. But the significance of forgiving took a huge leap for me in my personal experience of dealing with a broken heart. Forgiving those who had wronged me seemed like a herculean task, one that I was not willing to look at for a very long time. Not until I realized that by holding on to resentments and grudges, I was clearly doing more harm to my own physical and emotional being. Forgiving is healing – Healing from any pain or trauma in life has a lot to do with letting go of the past, the grudges, resentments, hurt and all the negativity in our lives. The act of forgiveness initiates the healing process. Forgiving is empowering – Mahatma Gandhi said that forgiveness is an attribute of the strong, that the weak can never forgive. Learning to forgive whole-heartedly is truly an empowering feeling, only making us stronger. Forgiveness is a gift to us – When we hold on to the pain of the past or harbor thoughts of revenge, we indirectly harm ourselves. But when we forgive others, we are not doing them a favor; on the contrary we are doing it much more for ourselves. Forgiveness brings peace – When we decide to forgive, we are making a conscious choice of focusing our energies on bringing into our lives a sense of peace and positivity. It is akin to removing the dead cells from our body and draining our wasted energies, making us feel lighter and calmer. Forgiving helps move ahead – Feelings of anger, revenge, pain keep us stuck in our past. When we choose to forgive, we release all that baggage and push ourselves towards the future. It sets us free. Life is just too short to hold on to ill feelings, to feel victimized and remain stuck in a rut full of resentments. Until we forgive and make peace with all that has happened in our lives, we deny ourselves the state of abundance. Forgive quickly. It will set you on the path of peace that can exist in spite of whatever has happened to you. How often do we make wish lists and write down our dreams. And yet, how often they remain just that on paper. But when we do see some of our deepest desires come to fruition, the thrill is incomparable. That’s how I felt when I created this blog last year – one amongst many of my wishes. The idea of this blog was shelved for more than two years as I contemplated whether or not to share my experiences from life. Was I ready to open up and speak my heart out? Clearly, I wasn’t then. So what made the difference? Inspiration from other women who blatantly came out with stories of their lives. In conferences that I attended, in articles that I read and many in person, these women boldly spoke about their real-life experiences. Some of them were horror stories of abuse and betrayal; few highlighted their resolve to bring about substantial changes while some were just plain facts of survival. Then there were celebrities who were breaking covert and revealing how they dealt with depression. All these voices were being heard and making an impact. Their stories were creating ripples amongst many like me. That was enough to push me out of my state of reluctance and into action mode, giving me the courage to start this blog. It’s been exactly a year since I created SoulMom and posted my very first blog post here. Ever since, it has been an interesting one year of blogging. The things I have learnt, the connections I have made and the effect this has had on me has made it all very special. Becoming a blogger is a new label that you earn, both in the online as well as offline world. It feels wonderful when people come up to tell you that they enjoy reading your blog and that you write very powerful content. Being recognised and appreciated makes me want to write more. The day I launched my blog on social platforms, a single mom reached out to me with her story. The fact that I could influence even one soul made this whole creation so much worth the effort. I do hope to touch upon more lives over time. When I acknowledge my fears, I find more ways to overcome them. As I reveal my own insecurities, it’s easier to accept my situation rather than conflict it. Every time I write a new post that unleashes my emotions and when I put it out there in the online space, my own internal dialogue enhances. In April earlier this year, I participated in my first A to Z Blogging Challenge. This is an online worldwide event where bloggers from across the globe share 26 blog posts in a month based on a theme, each post beginning with a letter of the alphabet for each day. It was such an exciting place to be in. Through this challenge and through my social media channels, I discovered so many other bloggers who were blogging on various themes. It is enriching to make new connections based on one common interest. Within a few months, I fast tracked from a blogger to an author with my first eBook – ‘Small Servings of Wellness’. Becoming a published author was a new high. With the help of blogging platform Blogchatter and its eBook carnival, we ebook authors also had the privilege of becoming official Goodreads authors. This felt very fulfilling. I have discovered that blogging is a self-learning process. One which requires time, effort and patience. My biggest lesson in my first year of blogging is that it truly helps if we are passionate about what we write. I am grateful to all my readers for being with me on this journey as a blogger. I sincerely hope you stay on and keep enjoying my content!